An 18-year-old woman was killed and 22 people were injured as a car drove into pedestrians in Times Square on Thursday. Andrew Siff reports. 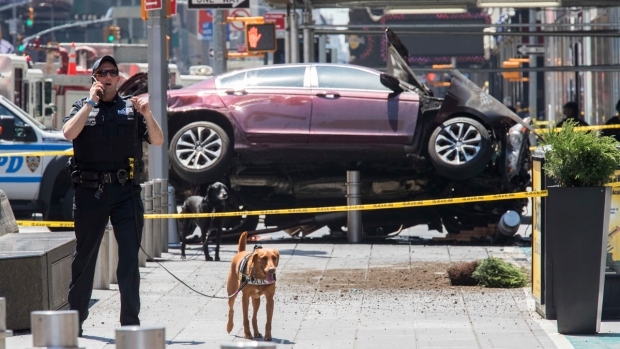 An 18-year-old woman died and nearly two dozen people were hurt when a wrong-way driver slammed into a crowd of pedestrians in Times Square Thursday, authorities said. The woman has been identified as Alyssa Elsman from Portage, Michigan. The driver, 26-year-old Richard Rojas of the Bronx, was taken into custody after barreling into the lunch-hour crowd on Seventh Avenue shortly before noon, according to police. 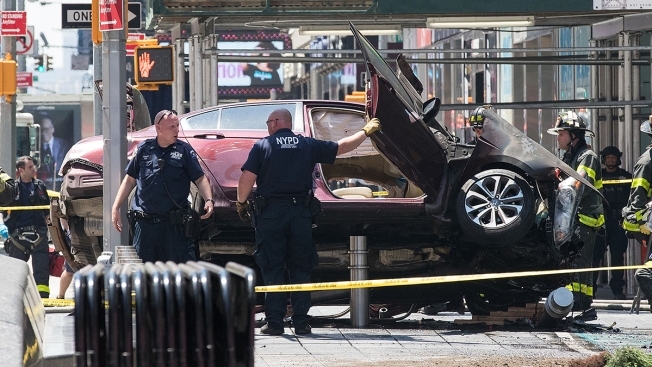 Officials and sources say Rojas, a former member of the Armed Forces with a history of DWI arrests, made a U-turn on Seventh Avenue at 42nd Street and started speeding down the sidewalk, mowing down pedestrians for three and a half blocks before crashing into a traffic pole. A cause of the crash is under investigation, but authorities say it's believed to be an "isolated incident" with no nexus to terror. Law enforcement sources say Rojas told police he heard voices. They said he has a history of possible psychiatric, drug and alcohol problems, and investigators are looking into whether or not Thursday's crash may have been a deliberate act. Law enforcement sources say Rojas appeared to be under the influence of drugs or alcohol when he was taken into custody. Sources say he blew a 0.0 when tested for alcohol at the precinct he was brought to for questioning. A law enforcement official said certain statements and tests suggest he was under the influence of something he ingested through smoking. In one of his two previous DWI arrests, Rojas was driving faster than 99 mph in a 50 mph zone, sources familiar with his record say. He resisted officers while being arrested for DUI in Florida, resulting in a dishonorable discharge from the Navy, law enforcement sources said. He was most recently arrested last week in the Bronx on a charge of menacing. After the crash Thursday, he allegedly tried to flee cops, then tried to physically fight them, as they brought him into custody. Mayor de Blasio said in a briefing at the scene that a total of 23 people, including the woman who died and her 13-year-old sister, were hit by the vehicle. Four of the survivors were taken to hospitals in critical condition. Many had traumatic injuries, including open fractures, officials said at a news briefing, adding those four victims were expected to live. It's not clear if the dead woman's sister was among the critically injured victims. Social media erupted with fear and concern as witnesses described screaming and abject chaos in the Crossroads of the World. Someone tweeted a photo of a maroon-looking sedan halfway on its side after appearing to crash into a traffic pole. Smoke emanated from the hood as pedestrians stood by in horror. Police radio captured the urgency of the response. 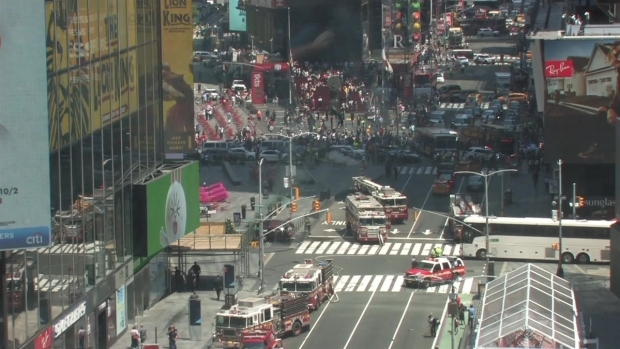 "Times Square, we got a car running people over on 42-7, going northbound on 7th ave, running people over," one NYPD dispatcher said, according to audio clips from Broadcastify. "Multiple people injured. Notify everyone." Witnesses said the vehicle was speeding -- one said up to 80 mph -- at the time of the crash. Many said it came out of nowhere. Some people were sobbing, others were simply stunned by what they witnessed. "I saw a woman flying through the air," Julio Sanchez Rivera, of Queens, said. "Just instinct that got me to duck inside that door and get out of the way." Kristen Boyce said she was seconds away from being hit; now she can't get the sound of it mowing down victims out of her head. "I was in shock, I was screaming," she said. "No one even saw it coming. ""All of a sudden I heard this boom and a car is barreling down Seventh Avenue hitting people, just, 'Boom! Boom!' And everyone just starts running," Boyce added. "We start running, we don't know if another one is going to come, we don’t know what's happening, everyone is panicking." Live traffic cameras showed a gigantic emergency response in the area; at least five fire trucks cordoned off the intersection immediately near the scene and a line of police cruises, alarms and lights blaring, blocked off traffic near the TKTS booth. The city later announced a series of road closures; it wasn't clear how long they'd be in effect. Nearby subway entrances and exits were also closed. Gov. Cuomo had been about 15 blocks away at a separate event at the time of the crash and hurried to the scene. He released a statement Thursday afternoon calling the crash "nothing short of horrific." "I was briefed at the scene by Commissioner O'Neill and saw firsthand the professionalism and diligence of New York’s first responders," Cuomo said in a statement. "As facts continue to emerge, my heart goes out to the victims of this terrible tragedy, as well as their families."